While Romy is named after one of my icons, her wardrobe for our upcoming beach trip was inspired by yet another. I have always had great admiration for Brigitte Bardot’s breathtaking beauty and immaculate style. She always had a knack for mixing both innocence and attitude, while maintaining sophistication and sexiness. 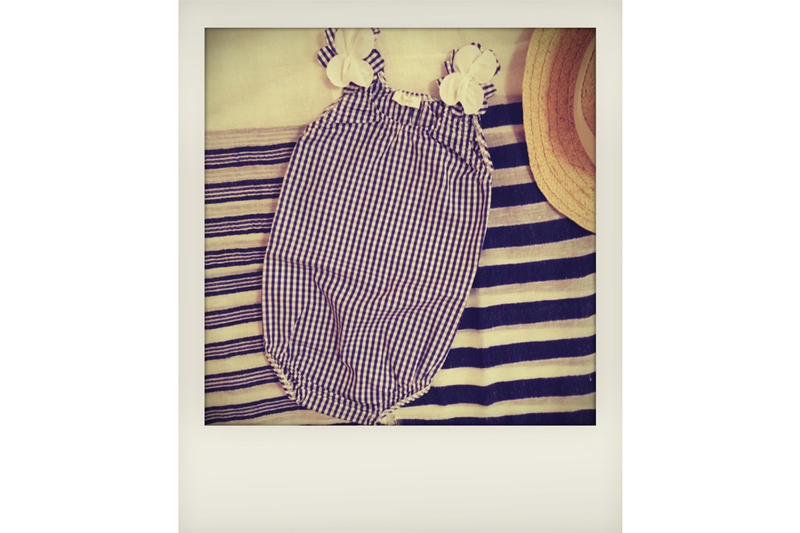 While shopping for our upcoming trip to Mexico, I stumbled upon this gorgeous baby swimsuit by Il Gufo. With blue and white gingham material and precious fabric flower details, it immediately made me think of Bardot’s St Tropez beach style, and I couldn’t resist! Paired with a straw hat by Little Fashion Gallery, and a striped Lemlem throw, Romy will definitely honor her French roots all the way to Mexico!